Starlight Racing's Sombeyay, the post-time favorite at 5-2, made a strong late bid in the lane to win Saturday's Grade 3 Sanford Stakes by about a half-length under jockey Javier Castellano. Trained by Todd Pletcher, the 2-year-old son of Into Mischief covered six furlongs over Saratoga's fast main track in 1:10.35. Bano Solo and Strike Silver were both quick out of the gate, but Castellano was content to sit behind those two along the inside rail down the backstretch. Sombeyay took a moment to settle, initially trying to rush up between the two leaders as stablemate Lexitonian was also pressing forward on his outside. Through fractions of :22.26 and :45.49, Bano Solo led Strike Silver by a head. At the head of the lane, Strike Silver took command, pulling away to a 1 1/2-length advantage. In the final eighth of a mile, Sombeyay finally found another gear and was able to get ahead of Strike Silver by a half-length on the wire. Whiskey Echo got up for third over Bano Solo. Bred in Kentucky by J. D. Stewart and Mueller Farms, Sombeyay was a $125,000 weanling at the Keeneland November sale, and was pinhooked through Taylor Made to bring $230,000 as a yearling at the September sale. Out of the multiple stakes-placed Teroda (Limehouse), the colt won on debut, and finished second in the Tremont Stakes by three-quarters of a length in his only other outing. Overall, Sombeyay has won two of three starts for earnings of $140,000. 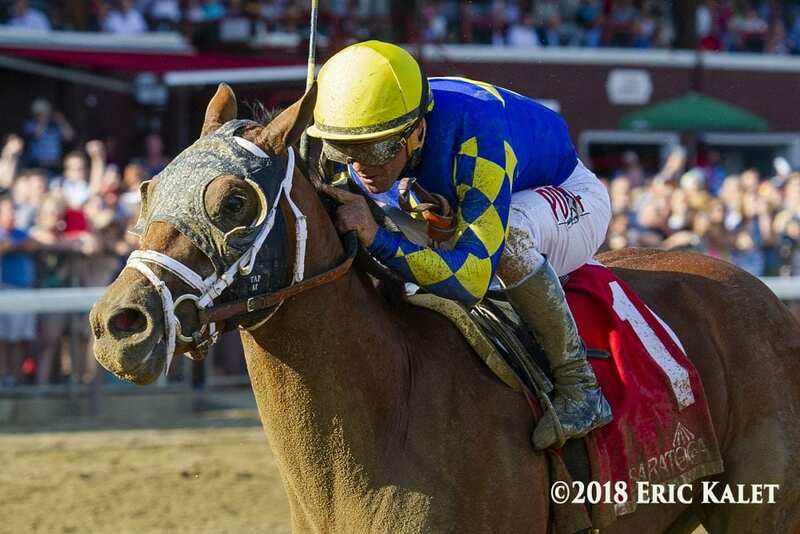 This entry was posted in NL List, Racing and tagged into mischief, Javier Castellano, Sanford Stakes, saratoga, saratoga racecourse, Sombeyay, Starlight Racing, Taylor Made, todd pletcher by Paulick Report Staff. Bookmark the permalink.